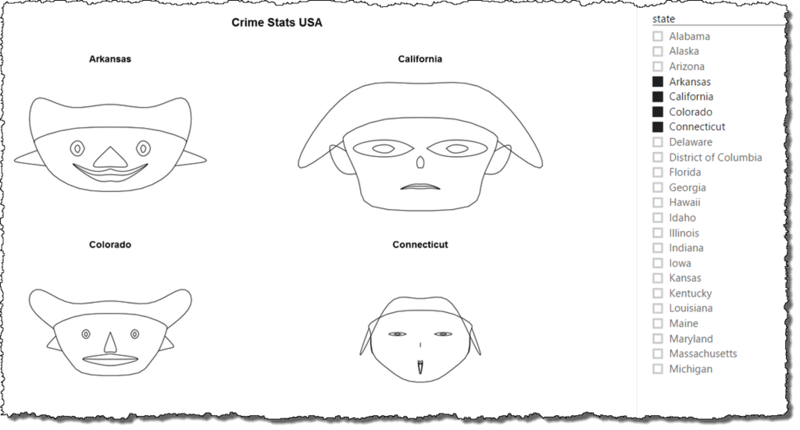 One of my favorite visualizations are Chernoff faces because they allow you to incorporate many attributes into a single visualization. Compared to a bar chart (which only displays one attribute), you can get a ‘full picture’ of the situation in a single iconic image (pardon the pun). Further, faces are a natural recognizable characteristic (for us humans) and this a fair bit of evidence to suggest you notice things in faces a lot easier than bland representations as a result of our social upbringing. 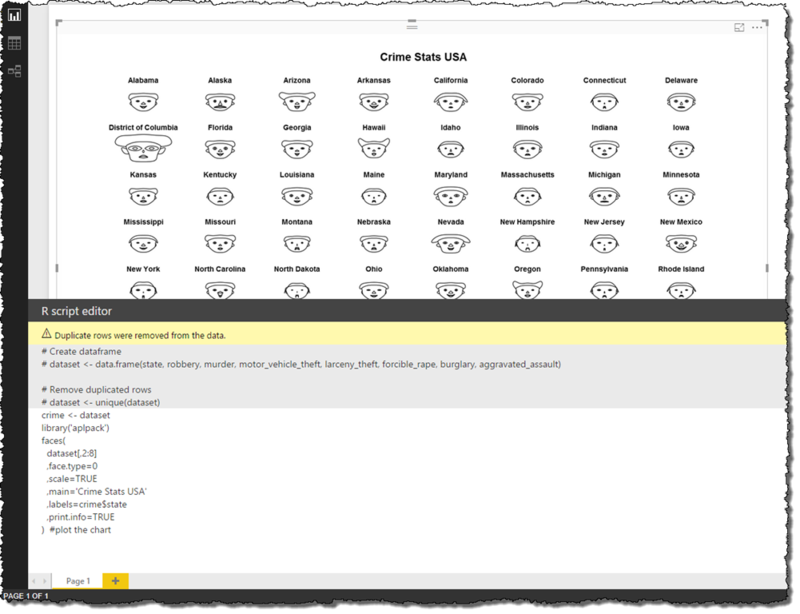 This post is about implementing Chernoff faces in Power BI (through R). Firstly (in this post), I will the infamous crime statistics demonstration, and in the second post, I’ll show child faces against different dataset (Northwind) which incorporates normalization. If you are not familiar with Chernoff faces, you can read more about them at Wikipedia here but basically they use facial characteristics to display an attribute value. For example, the size (height) of the face may be related to income, the width of the face might be related to quantity with the size of the eyes related to margin. Before you can use R in Power BI, you need to install that are is installed on your local machine and that you have set and enabled R’s working directories in Power BI. To set R options in Power BI use the File > Options and settings > Options menu path. You can see that the directory of R needs to be set and you need to allow R to plot a visual in Power BI (this is a preview feature). I’ve included these images show the both the R directory setting and the use of R to plot visuals. 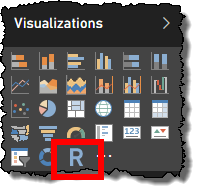 Once these features are enabled, you should see the R icon appear in your Visualisations pane (note that you’ll need to restart Power BI if you enabled R as in the above checkbox). code the visualization (in R). Note that the data available in R code (ie the data frame) is defined by the data that was added in the prior step. I have tried to show all these steps in the image below. One thing to note about adding data to the visualization is that the order in which you add fields (from the model) defines the columns that are in the data frame. This is important (for the Chernoff faces in R) because the first fields of the data frame defines the axis (grouping) of faces. Note that you can also see this order in R script editor in Power BI (the code is in the image below and un-editable in Power BI but looks like # dataset <- data.frame ( columns )). 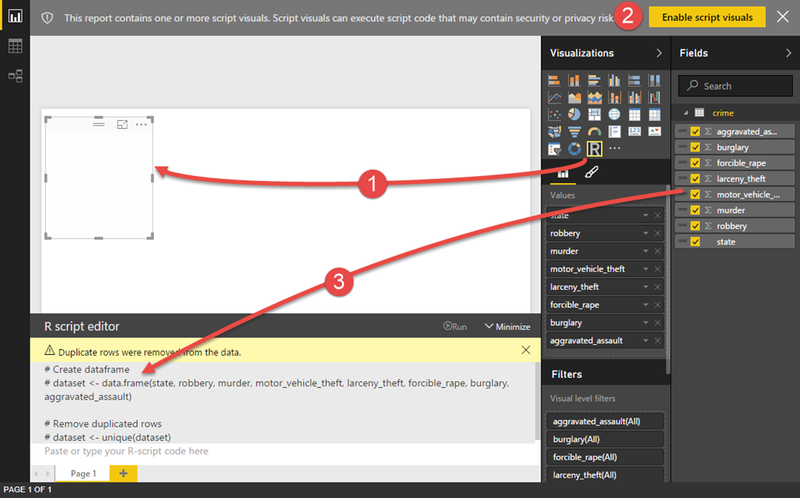 You may recall (from the R script above) that we referred to crime as a data frame in R when we built created the code in R. In Power BI however, the data frame is referred to as dataset so in order to use our original code, we need to either create a new data frame in R (called crime) or change our existing R code to use a data frame called dataset. I’ll go with the first option and paste the following code into the R script editor (where you see ‘Paste or type your R-script code here). Of course the great thing about Power BI is that there is automatic filtering among visuals on the page. The next thing to do is add a slicer for state and allow the user to select what states to show. The R visual updates automatically. 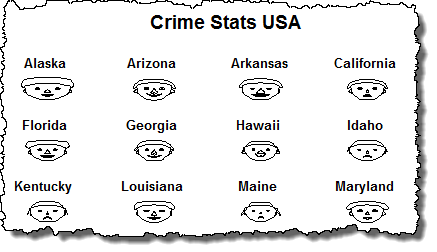 Doing this we can easily build a visual that allows the user to select and compare the faces of the states they select (as below).